f my plane every goes down, the NTSB is likely to find two things: the ubiquitous "black box" and my luggage. Having carried around the crappy nylon luggage that everyone else uses for years, I decided it was time for an upgrade. It needed to meet international carry-on bag standards. It needed to have a "suiter" (folding compartment to carry a suit and/or shirts), it needed to look nice and be easily identified, and it needed to withstand significant airline abuse. The first challenge was to decide on a material. Leather, canvas, carbon fiber, aluminum, and polycarbonate (not polycarbonate composite) were all in the mix. Leather was nice and would develop a nice patina with all the mis-handling, but was also likely to get stolen. Canvas was too crushable. Carbon fiber was nice but $2,760. That left aluminum and polycarbonate. Aluminum could take more abuse, and polycarbonate was also strong and lighter. 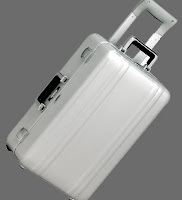 Eligible brands included Titan, Tumi, Zero Halliburton, and Rimowa. In the end, I chose the aluminum Zeroller ZR21T by Zero Halliburton. With 6 wheels, an aircraft aluminum exterior, metal handles, nice lining, and a TSA lock built-in, it also is able to fit in the overhead. Steel locks keep it closed. You can sit on it when you run into places with no seats. The light color/reflective nature of the aluminum keeps it cool in the summer sun. Interior straps keep everything in place. The interior lining is the best I've seen. Removable suiter when it's a pleasure trip and not business. 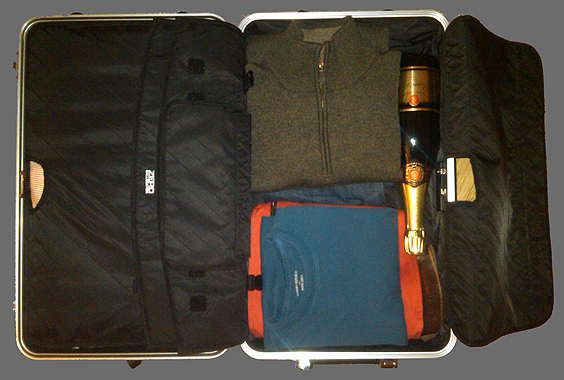 Oodles of room, and even the Champagne is protected. Every ZERO Halliburton aluminum Case starts with a two-ton coil of aircraft-grade aluminum. After being cut into individual pieces, the aluminum is “deep-drawn” over special steel dies using 440 tons of pressure. As the shape is formed, the molecular structure of the aluminum actually changes, resulting in a shell that's free of wrinkling, distortion and manufacturing inconsistencies. Following the deep-draw process, the shell is heated to more than 1000 degrees Fahrenheit and then quickly cooled, making the aluminum even stronger and more durable. Each shell is then buffed and electro-chemically anodized to add color and prevent corrosion.